Twitter is all abuzz this morning with re-posts of this ReadWriteWeb blog, which says the micro-blogging site is clamping down on the way people converse. 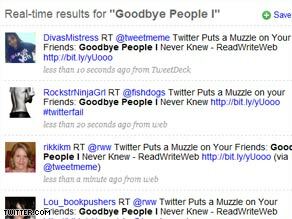 A piece of the blog's title - "Goodbye people I never knew" - has become one of the top 10 topics on Twitter today. In what the company called a small settings update, users no longer see public replies sent by friends to people they themselves are not following. (Fragmented conversations, they are called.) This isn't a small change at all, it's big and it's bad. The new setting eliminates serendipitous social discovery. Follow the live conversation here and here. Also in Twitter news today, the site will shut down for an hour of maintenance at 2 p.m. ET. On the site this morning, people are also complaining of glitches. I'm not sure what Twitter is doing, but the way I use Twitter is that I follow many CNN newscasters and the Whitehouse group. These individuals post questions on Twitter relating to their upcoming shows and topics of concern. It is to these postings that I respond in my tweets. It sounds like I will no longer be getting the posts from these sources. If this is so, Twitter has just defeated its only feature that makes it so valuable and popular in todays tech arena. I do not tweet back and forth to another individual at all. I use email for that. Tell me Twitter isn't shooting itself in the foot. Perhaps I did not understand what they are doing. Oh my God, why does this website even exist? Couldn't they just make it an option for me to set so I can choose whether or not I want "serendipitous social discovery"? Doesn't take much more coding then what they're doing now. Does anyone else find it strange that a site like Twitter is shutting down in the middle of the day US time? I recognize it's a world site, but clearly their pattern analysis shouldn't indicate that 2PM eastern is the best time to do maintenance? The other challenge I find with Twitter, which our CMO urged us to get involved with, is the limit on how many people i can follow – 2000, unless I have more than 2000 followers. It's arbitrary and doesn't contribute to building tribes. The beauty of twitter was the discovery of new and interesting folks to follow through the completely organic process of seeing someone you already follow (and know and trust) talking to someone else that they already follow, but who was unknown to you. I think everyone can probably agree that a recommendation from a friend for anything, whether it is a product, new hire, or new friend, is a far more effective way to successfully discover something you will like. With this switch, they have effectively isolated everyone away from that discovery, unless the take steps to actively seek new people out on their own. That is a much higher barrier to entry for participation and a bad move on their part. It would be nice if when a service went more mainstream, they didn't need to dumb it down so much, and take options away from their early adopters that used and evangelized their site. Why is this news??? I wish CNN would stop covering Twitter stories – I see so many of them it makes me wonder if they're getting kickbacks. I could never understand the Twitter concept, that is why I prefer communication through sites like Sonicgateway.com and their Scribble. Twit. Tweet. Twitter. Get a life people! If you have to spend all your time on Twitter, Facebook, MySpace, and a thousand other internet sites, or your precious cell phone you are wasting the few short years you have on earth. You are bored with yourself and therefore are a boring person. I am very upset over this!!! As you see in the picture above...that's ME and I had to let all my followers know about this DISTURBING issue!!! I really am going to need TWITTER to change back to the way that it was...we should have a choice to choose our timeline...NOT YOU!!! They are getting kickbacks. The great Twitter Battle of '09 (Ashton vs CNN) mean tons of new CNN followers. All CNN does is link to articles on their website. Thousands of extra clicks = thousands of extra eyes viewing ads on the site. @Jeff May 13th, 2009 1:36pm ET – wow, that didn't add anything to conversation at all. CB radio for the Internet Generation. Breaker One Nine...I'm taking a crap right now! I use Twitter primarily to keep up with breaking news from various news organizations (including CNN) and with a few select friends, and have been a member for just over a month. In that month it has been down for maintenance at least one full day, and spent more time overloaded than not. Today's scheduled maintenance was supposed to be one hour at 2 PM ET, but the service was down long before that, and no information is available as to what the problem is. I'm going back to email as my primary means of keeping up. Twitter is unreliable and a pain in the bum. I guess I'm just too much of an introvert and/or too verbose a writer, but I never found the central idea of Twitter – finding and communicating with total strangers in clipped nubs of sentences – to be all that appealing. Twitter Search is mildly interesting, but the actual tidal flow of useless trivia about other people's lives and irrelevant opinions just turns me off in the worst way. I have a couple people I'm following and quite frankly, if I know you or heard of you and like you, then I'll hook you up. I really don't look at that to tell you the truth, I don't. Like today I hooked up Queen Rania, she rocks, I do admit I know a little about her but after learning a little more, she doesn't rock, she rocks even more, LOL!! I even hooked up the Astronaut guy, it was actually Coach Carroll who I also follow...hey, he's a dynasty from a school...as long he's there, LOL!! And the other ones are just mostly news, to say the least. To me it don't really matter, I don't really pay attention to it. But look on the bright side, that means I can't send a tweet to Larry during the show...wait a minute, is that good? I can't holla real quick? Ohh hell no!!! LOL!!! Actually, they nailed this one. I stopped using Twitter because 95% of the tweets I saw were "@[someoneIdon'tfollow]: [a snippet of conversation that makes no sense out of context]." I may actually use it again if I don't have to wade through the noise of context-free conversation fragments. Discovering new friends via conversations is what made Twitter unique. Removing this feature makes them just another private messaging service. Seriously they just FUBARED the whole thing. Now I dont even get ReTweets from the News Services I follow, including NASA...whats that all about? I don't Twitter and have no desire to! Why do so many people feel the need to be connected 24/7? Who has the time for this trivial pursuit? Unplug and feel the freedom! I like this change. You can still browse through who your friends follow by looking through their "Following" page to find new people, but you don't have to read through one-sided conversations. Interact with people face to face... trust me it's much more interesting. I can not think of a more useless story or concept. It embarrasses me to be human at this point. CNN and MSNBC, does tweeter pay you to cover their stories on a daily basis? This is not news! Dumb-dumb! I agree, stop stalking people and go talk to someone. Look up from your phone and maybe tweet someone in a coffee shop "Hi at @theguyatthecounter, its a nice day isnt it"
really people? twitter is a dying fad, in 2 years people will be back to relying solely on facebook and m..my..myspace is it? or whatever the other one is these days. Iv read more intresting news on a bathroom stall before.